Russia and China kept increasing their spending on weapons last year, while the global financial crisis hit military spending in the U.S. and Europe, a leading think tank said Tuesday. Russia overtook Britain and France to become the world's third largest arms spender, to the tune of some $8 billion — a 9.3 percent increase over 2010. The Stockholm International Peace Research Institute says budget cuts kept worldwide military expenditures nearly flat at 0.3 percent in 2011, marking an end to an 11-year trend of growing arms spending. China boosted its purchases by 6.7 percent to around $143 billion, remaining the world's second largest arms investor. The world's leading arms buyer, the United States, cut military expenditure by 1.2 percent to $711 billion, while Europe marginally increased its spending to $407 billion. "The aftereffects of the global economic crisis, especially deficit-reduction measures in USA and Europe, have finally brought the decade-long rise in military spending to a halt — at least for now," said Sam Perlo-Freeman, head of SIPRI's Military Expenditure Project. Last year, six of the world's top military spenders — Brazil, France, Germany, India, Britain and the U.S. — cut their military budgets. Russia's growing expenditure was mainly driven by the country's aim to replace 70 percent of its Soviet-era military equipment with modern weaponry by 2020, SIPRI said, adding that it expects the Kremlin to increase its military spending in coming years. "They are clearly putting very high priority on building up their military power again," Perlo-Freeman said. He said Russia lacks important modern communications technology for the battlefield and wants to hedge against America's overwhelming military might even if there is no current hostility between Russia and NATO. 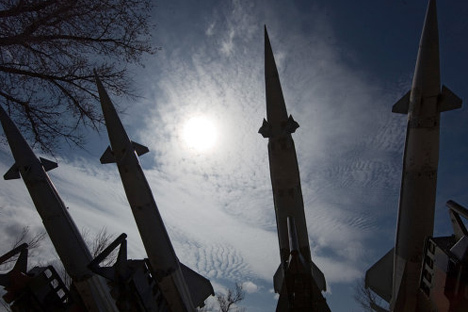 Perlo-Freeman said many analysts doubt whether the Russian arms industry will be able to fulfill such ambitious plans after two decades of stagnation in the wake of the Soviet collapse. One of the key reasons for the slight U.S. decline was the long delay in Congress agreeing on a 2011 budget as the Obama administration clashed with Republicans over measures to reduce the deficit, SIPRI said. The institute expects American arms spending to continue falling due to the withdrawal of U.S. forces from Iraq, the drawdown of U.S. forces in Afghanistan, and the Budget Control Act, passed by Congress last year. SIPRI said China's spending is in line with its overall economic growth and has remained stable at around 2 percent of the country's GDP since 2001. It noted that China's increased arms spending has caused concern among its neighbors and contributed to higher arms outlays in both India and Vietnam. But the report said talk of an arms race in Asia would be premature because data and analysis reveal mixed trends in arms acquisitions. Despite the increases, the Chinese military technology still lags behind America's, SIPRI said. "The U.S. is still going to maintain for the foreseeable future overwhelming military dominance," Perlo-Freeman said. "The U.S. still outspends China five to one, and Russia's spending is half of China's."